Body Aware Massage has been owned and operated by Robbin Blake, Licensed Massage Practitioner and Certified Aston-Pattterner, since the beginning of 2005. Robbin uses both Orthopedic Massage and Aston-Patterning® in her sessions to help her clients recover from injuries and from chronic pain. 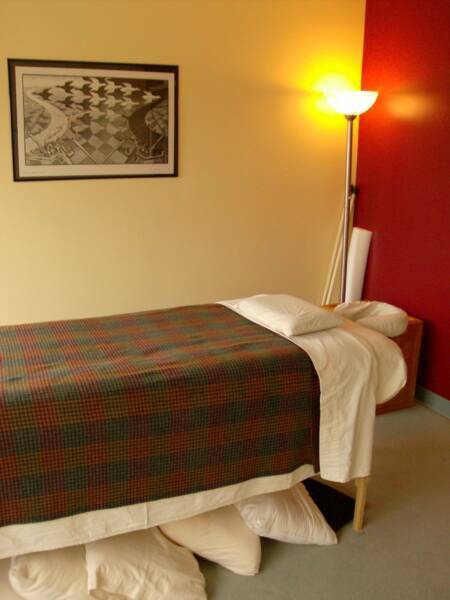 Orthopedic massage is site specific treatment to the injury or dysfunction that helps injured tissues to heal, improve in mobility and/or become more resilient. Aston-Patterning® is a structural bodywork that Robbin uses to improve general or area specific alignment to either help support an injured area or to decrease the stress from the dysfunctional area on the rest of the body. Aston-Patterning® is also a movement and ergonomic system. The focus of Robbin's practice is to not only help her clients to recover from injury or chronic pain but to identify those things within their environment that place physical strain on their bodies and to make changes to reduce that strain. Robbin also works with her clients to either change how their bodies work within their environment (home, work or play) or educates her clients on how to change their environment so that less strain is placed on their bodies. Robbin works with the traditional and complimentary and alternative healthcare systems and provides regular progress reports to referring physicians to ensure that client care is coordinated. What conditions can be treated with Orthopedic Massage and Aston-Patterning®?